Earn more revenue when your players engage with video ads and offer wall campaigns in exchange for virtual currency. Reach captivated audiences worldwide with globally-sourced demand. 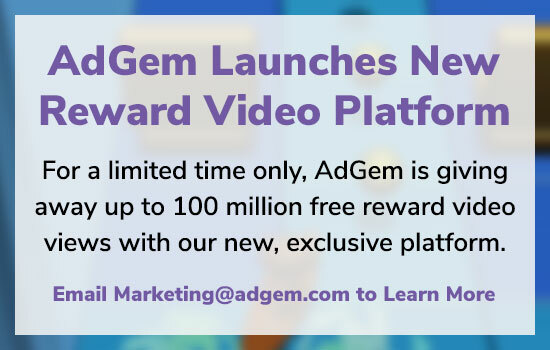 Monetize your non-paying users and earn more from your mobile games with high-performing ad units by AdGem. Seamlessly advertise with AdGem and run CPCV, CPI, CPA, and CPE campaigns to expand your user base. Robust targeting capabilities ensure your tailored ads reach the ideal audience. Pre-cached HD video ads create effortless, high-quality user interactions. Control design and functionality for optimal ad engagements. Make your user experience unforgettable with all new vertical video advertising, designed with the user in mind, featuring high-quality graphics and zero buffer time. Compatible for all major ad formats to work with your app, driving new and existing users on mobile devices. Real-time analytics dashboards provide complete transparency with immediate, detailed results for unlimited campaign control. Dedicated, in-house support available at all times to deliver reliable campaign management. Lightweight, easy integration for your monetization needs.